When rumors began spreading that Intel was going to collaborate with AMD in the integration of Radeon graphics cards in its processors, it sounded more like a joke than a real project. However, it turned out that the two Californian giants have really shaken their hands and have prepared something big, and the first laptop manufacturer to take advantage of the new chips is another US company – Dell. XPS 15 9575 2-in-1 is the name of the first model that uses a hybrid Intel/AMD processor. When it comes to the chip, the machine arrives in two options – with either Core i5-8305G or Core i7-8705G. Both models are quad-core and work with a Radeon RX Vega M GL integrated graphics card (also called Radeon RX Vega 870), as the bigger one runs at higher frequencies and has more cache memory. However, this is not the only intriguing feature of XPS 15 9575 2-in-1. The new series offers an innovative cooling system, great display options, and sleek body. Opening the box of XPS 15 9575 2-in-1 reveals another box – this time far thinner and more elegant. So thin that there is no room for the Dell Premium Active Pen stylus, which we hoped we’d find inside, considering the laptop price. In turned out that the stylus is bought separately and its price in the USA is $99. The stylus itself sounds amazing on paper – 4096 pressure levels and 1-year battery life. Overcoming the slight disappointment of its lack, we notice a 130W charging device featuring Type-C port, Type-А to Type-C dongle and some user manuals. We were pleasantly surprised by the label “100% recycled plastics, 25% from oceans” – PR or not, Dell has put some effort into helping the nature and this is worthy of respect. We know you wouldn’t otherwise type it, so here is the link. 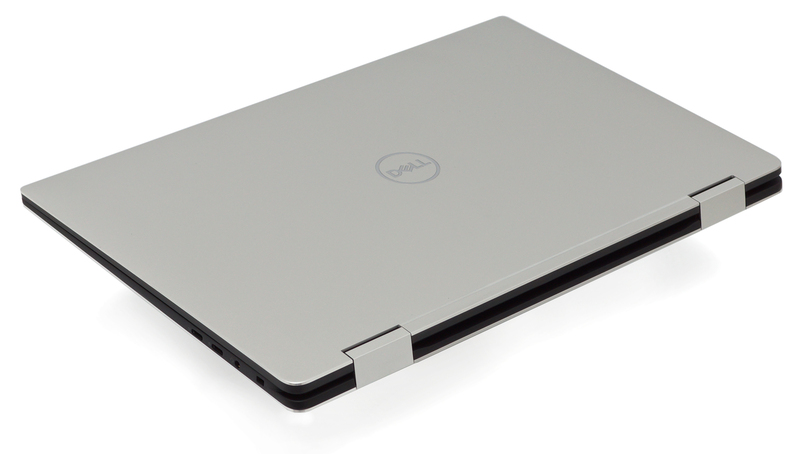 Dell XPS 15 9575 2-in-1 is the tiniest and thinnest 15.6-inch 2-in-1 laptop in the world. This is a pretty good start to the Design and construction section when it comes to a notebook that can easily be considered a working station. 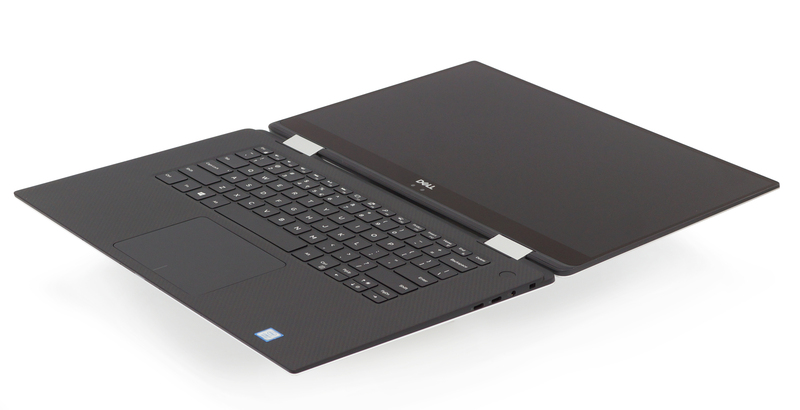 The thickness of XPS 15 9575 2-in-1 is between 9 mm (front) and 16 mm (rear) and its weight starts at 2.0 kg. The construction itself is extremely tight and robust which is great for two reasons – the first one being the relatively high price of the laptop, and the second – its ability to rotate at 360 degrees and it’s important after 5 years of use to continue getting its job done. It seems that we can trust Dell engineers in this respect given the fact that the construction is a pretty solid mix of aluminum (in the chassis), carbon (in the palm rest area), steel (in the hinges) and Gorilla Glass 4 (in the display). We have no complaints about the appearance, the model looks amazing – the ultra-thin bezels called “InfinityEdge” by Dell contribute to that. 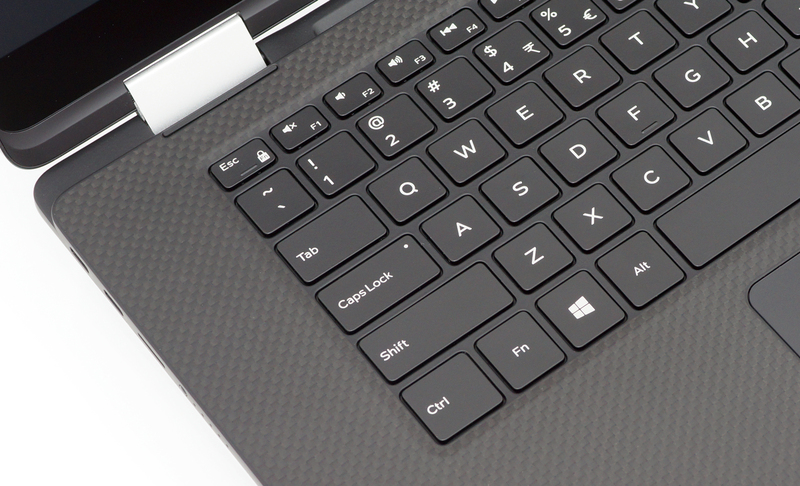 In addition, the keyboard that Dell calls MagLev is pretty interesting. It looks very much like those in modern MacBook Pro models – very short key travel and tactile feedback. Its construction is based on a butterfly mechanism and magnets that allow long-term reliability that doesn’t wear out. 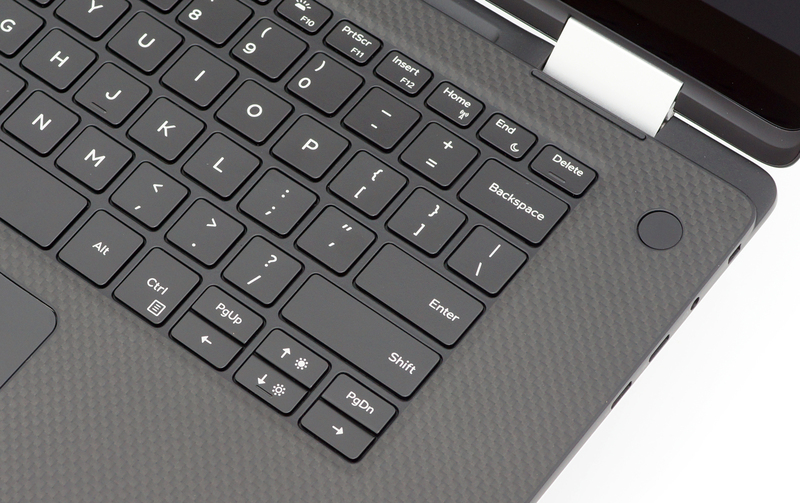 At the top, on the right side of the keyboard we notice a fingerprint reader which is combined with the Power button. It is convenient and simple to use, but keep in mind it is optional so your configuration may not feature one. 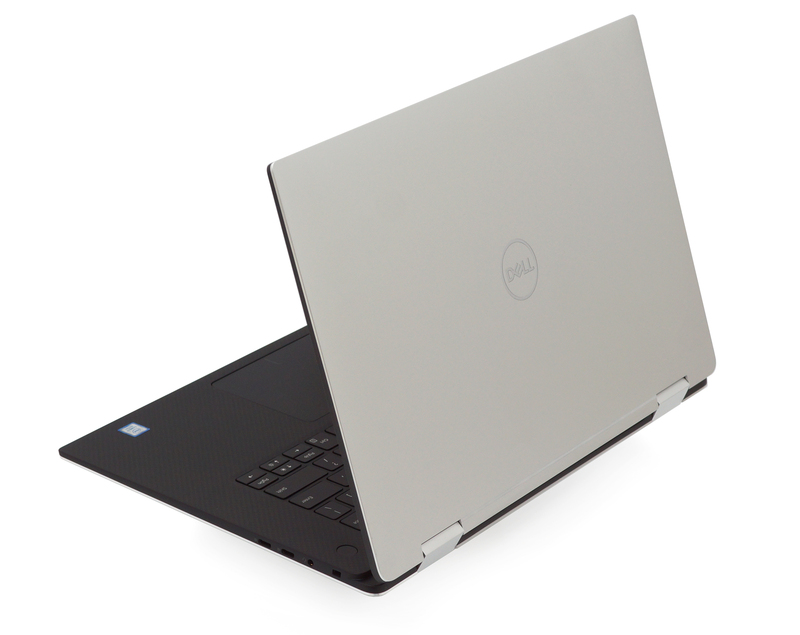 The first thing that will catch your attention while looking at the Dell’s XPS 15 9575 2-in-1 body is the lack of “big” USB Type-A ports. Yes, the model works only with USB Type-C, and as we mentioned at the beginning of the review, there is a dongle available for your Type-A accessories. 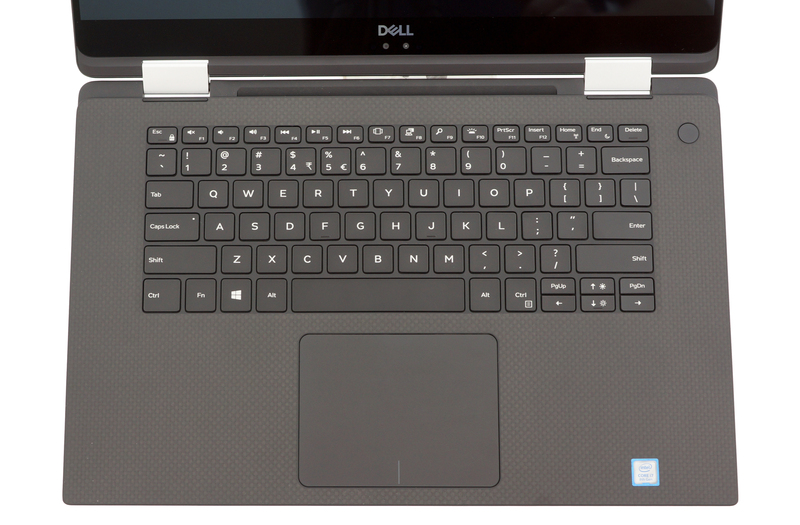 On its left side, Dell XPS 15 9575 2-in-1 is equipped with two USB Type-C ports, MicroSD card slot, and a battery indicator button. The right side incorporates other two USB Type-C ports (support for DisplayPort / HDMI), combo audio jack and Noble Lock slot. 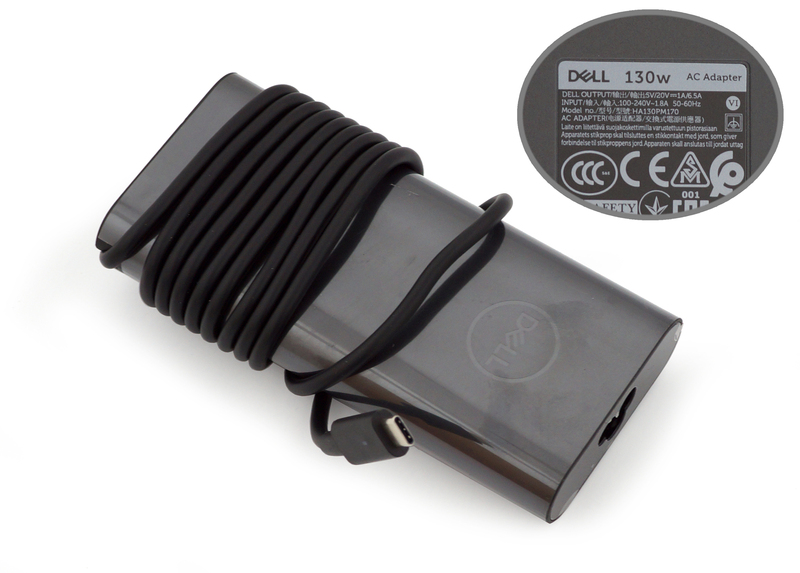 All Type-C ports can be used for charging the laptop. Dell XPS 15 9575 2-in-1 is equipped with a Full HD IPS touch-sensitive panel with a model number Sharp SHP148E (4xx10-LQ156M1). It has a diagonal of 15.6 inches and a resolution of 1920 x 1080, leading to a 16:9 aspect ratio, pixel pitch of 0.18 х 0.18 mm and a pixel density of 142 ppi, thus making it appear as “Retina” when viewed from at least 60 cm. The viewing angles are comfortable. 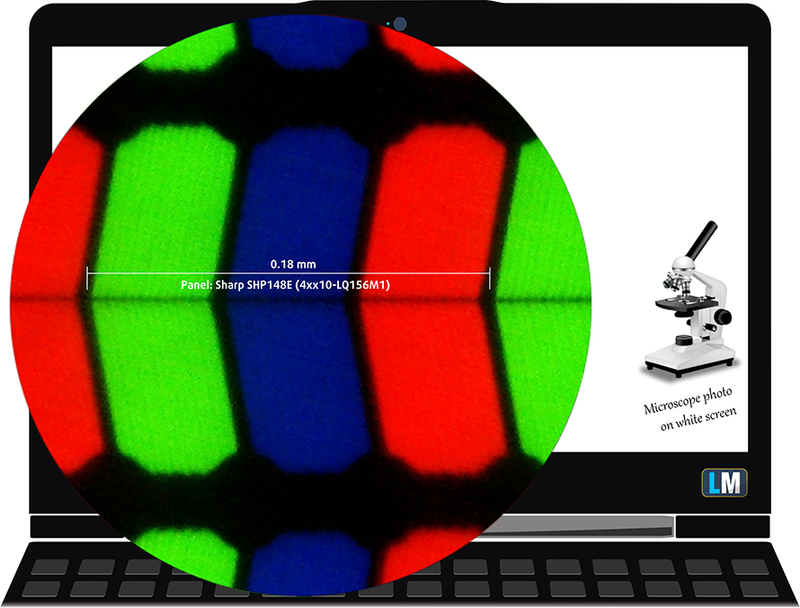 We offer images at 45° to evaluate image quality. 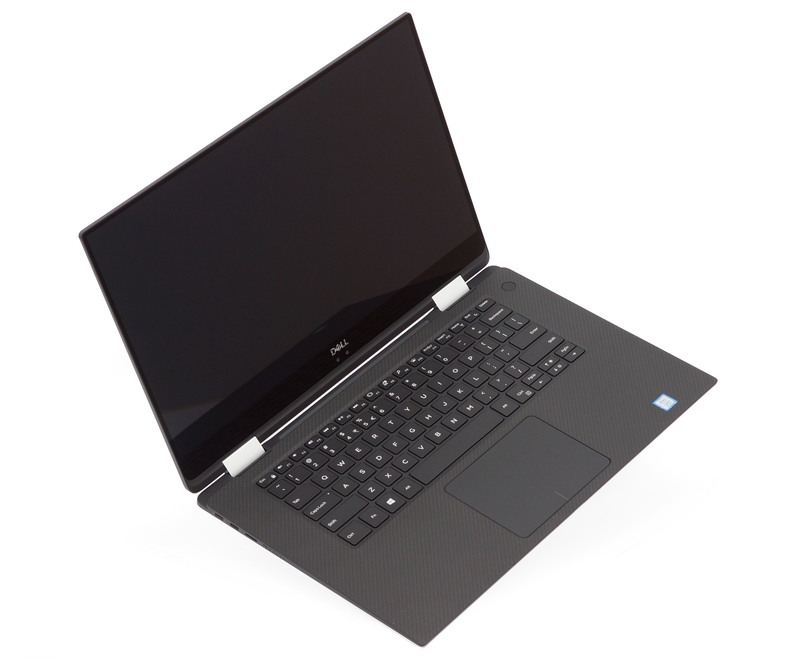 The screen of the Dell XPS 15 9575 2-in-1 has an excellent maximum brightness of 410 nits in the middle of the screen and 367 nits as an average for the whole area, with a maximum deviation of 18%. The Correlated Color Temperature on a white screen is 6600K – very close to the optimal for the sRGB standard of 6500K. The average color temperature through the grey scale before profiling is 6800K. In the illustration below you can see how the display performs from uniformity perspective. In other words the leakage of light from the light source. 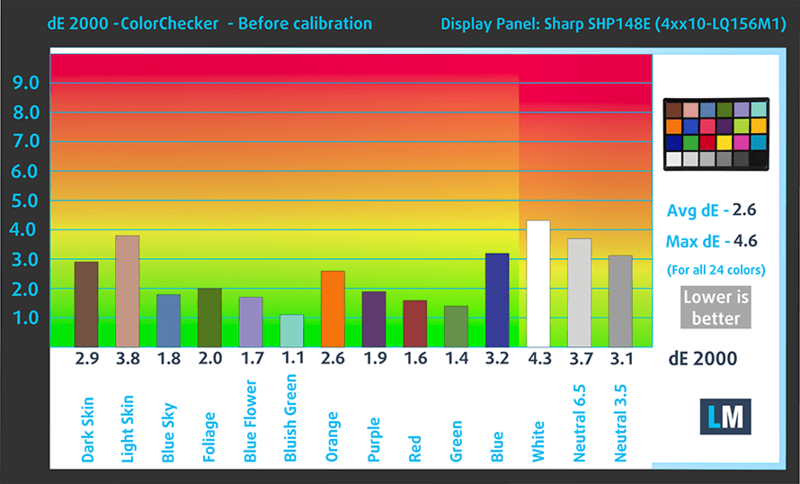 Values of dE2000 over 4.0 should not occur, and this parameter is one of the first you should check if you intend to use the laptop for color sensitive work. 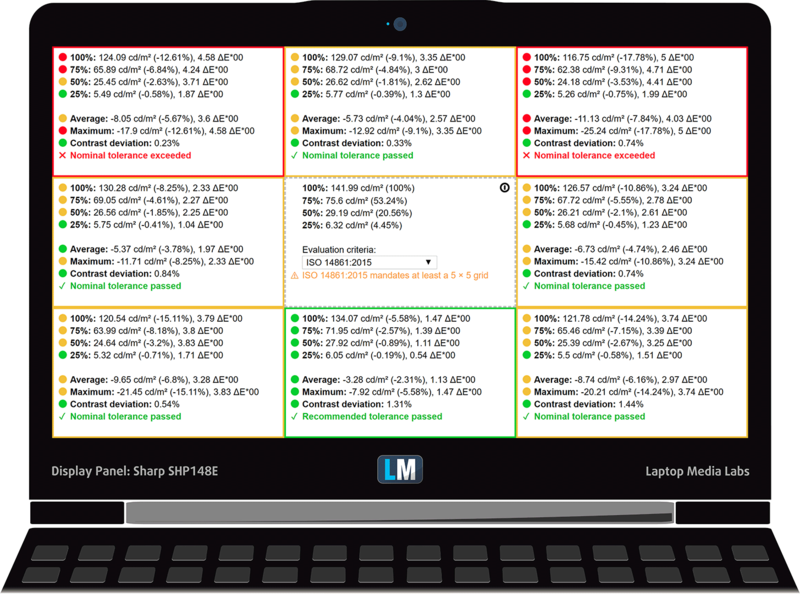 The contrast ratio of the panel is very good – 1620:1 (1460:1 after profiling). The coverage of Dell XPS 15 9575 2-in-1 is shown by the yellow pointed line. Its display covers 95% of the sRGB gamut of sRGB/ITU-R BT.709 (web/HDTV standard) in CIE1976. Below you can compare the scores of Dell XPS 15 9575 2-in-1 with the default settings (left), and with the “Gaming and Web design” profile (right). We recorded Fall Time + Rise Time = 32 ms. The matrix is not one of the fastest. The light emitted from this panel pulsates (uses PWM) up until 110 nits meaning that the display is comfortable for extended periods of use in this aspect. The display of Dell XPS 15 9575 2-in-1 is equipped with a touch-enabled panel by a manufacturer well-known for its innovations and elite displays. The bright and contrasty image, accurate colors and lack of PWM above 110 nits would have made it a great choice for many applications including presentations of web designers. However, we are using a conditional sentence because the sample has too high Luminance Nonuniformity along the surface of the screen compared to the center, which directly makes it not the most desirable device for color work. The sound emitted from Dell XPS 15 9575 2-in-1’s speakers is on point with clear low, mid and high frequencies. Now, we conduct the battery tests with Windows Better performance setting turned on, screen brightness adjusted to 120 nits and all other programs turned off except for the one we are testing the notebook with. 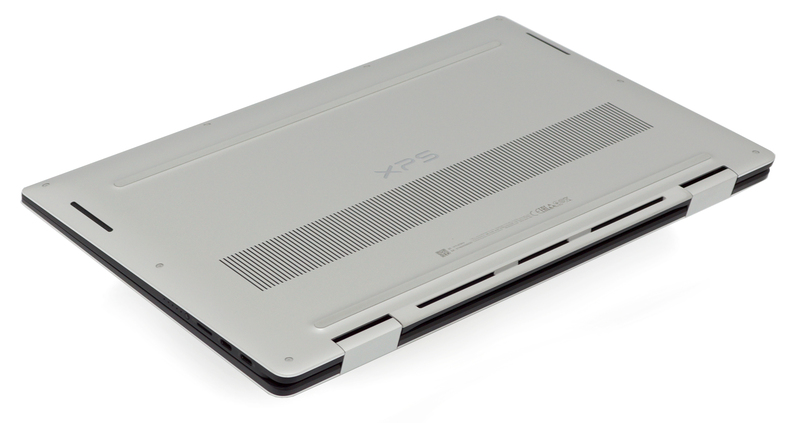 Despite its small dimensions, XPS 15 9575 2-in-1 features a 75Wh battery – impressive. 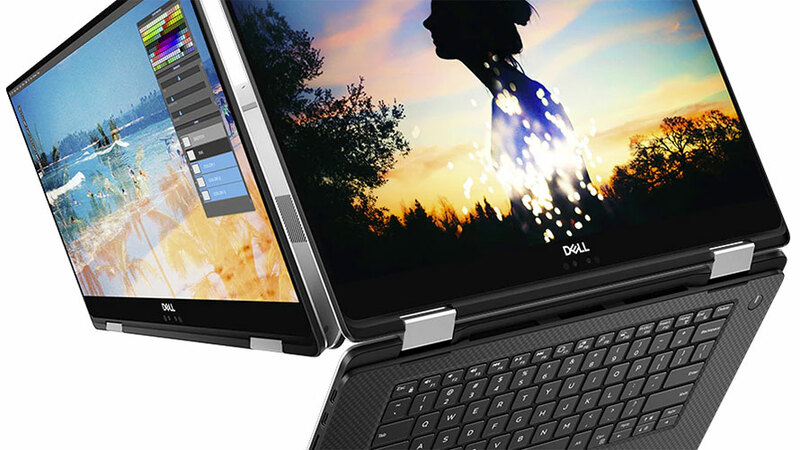 The Dell XPS 15 9575 2-in-1 comes with 2 different processors – Intel Core i5-8305G and Core i7-8705G. Both are based on the Kaby Lake architecture and differ only in clock speed and cache memory. The more powerful one, 8705G, outperforms significantly Core i7-8550U but drags with 8-9% behind the ULV Core i5-8300H. Both processors feature two graphics cards each – Intel HD Graphics 630 + AMD Radeon RX Vega M GL. There is a minimal difference in the maximum frequency of the HD Graphics chip – +100 MHz in favor of the i7-8705G (1.1 GHz vs 1.0 GHz). 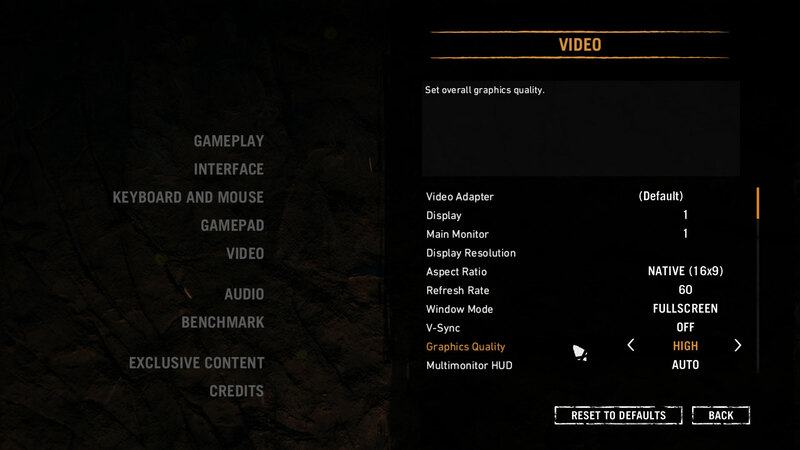 As we already mentioned, no matter which processor you will opt for, you get HD Graphics 630 + AMD Radeon RX Vega M GL. It turned out that the latter is suitable even for gaming and it comes close in some tests to GeForce GTX 1050 Ti as regards performance. However, as far as games are concerned, the optimization is not on point at the moment. Either way, the XPS 15 9575 2-in-1 is far from being the most suitable for a gaming notebook. Here we have to note that XPS 15 9575 2-in-1 works with V-Sync, which we weren’t able to turn off, so the minimum frames per second (if below 60) should be taken into account for potential comparisons. 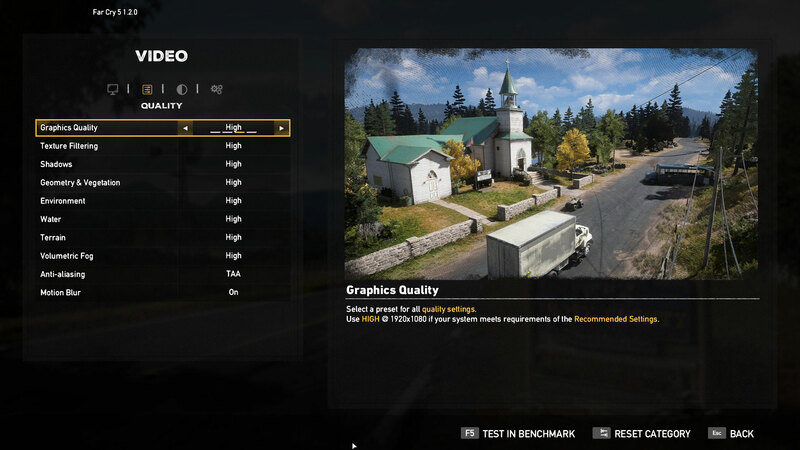 AMD Radeon RX Vega M GL is around 10-20% less powerful than GeForce GTX 1050 Ti in the gaming tests and approximately on par with GTX 1050. Our XPS 15 9575 2-in-1 unit came with a Toshiba XG5 KXG50ZNV512G SSD which stands out with high sequential Read speeds (up to 3.13 GB/s) and not so good Write speeds – 0.46 GB/s. 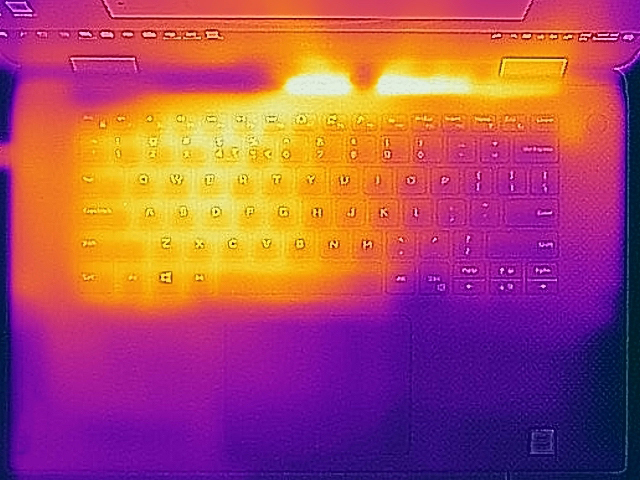 As it suits a serious business notebook, the temperatures of Dell XPS 15 9575 2-in-1 at high load are within the normal. 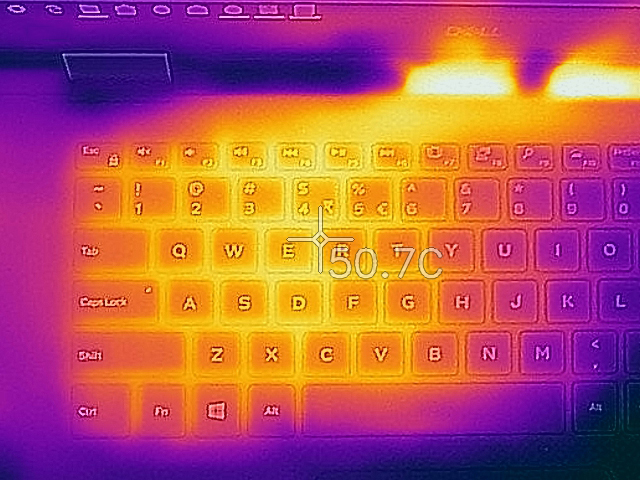 At the hottest point, during extended processor work period at 100%, the degrees reached 50.7°C. As we’ve already mentioned several times, the price of an XPS 15 9575 2-in-1 is pretty high. But if this is not a problem for you, then the machine is worth it in every aspect. Many business laptops, even high-end ones, are bulky and solid in order to be more reliable but XPS 15 9575 is only 9-16 mm thick, and in terms of dimensions looks like a 13-14-inch model thanks to its super slim bezels. However, this doesn’t mean it’s unreliable – its construction is made of aluminum, steel, carbon and Gorilla Glas 4 glass, and it also doesn’t sink in or make awkward noises even under significant pressure. The only setback as a result of the dimensions is the lack of USB Type-A ports, however, there is a dongle in the package. Taking into account the size of XPS 15 9575 2-in-1, we were pretty surprised by the battery capacity – 75Wh turned out to be enough to supply the powerful processor and graphics card for more than one working day. The screen has a very high color accuracy (with our Design and Gaming profile), and uses PWM only at low brightness levels (our Health-Guard profile fixes this issue).